If your water heater is broken then it can be very inconvenient. Simple tasks such as washing up or taking a bath can become very difficult. Even if your heater is not completely broken, then you could be wasting a lot of money on energy bills if your heater is working inefficiently. 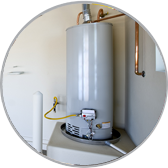 If you have any concerns about your hot water supply then you may be considering a water heater replacement in San Tan Valley, AZ. We can carry out a full assessment of your current heater to determine whether a replacement is the best option for you. If you have had to repair your heater more than once, then it may be that a replacement is the most cost effective option in the long run. Once you have started to experience problems with your water heater this is usually a sign that it is coming to the end of its working life. When we carry out a water heater replacement we only use modern heaters that are energy efficient and come with an extended guarantee. This means that you can be confident that you will not need to get your heater repaired anytime soon. When your heater is installed we will do through everything with you so you are able to get the most out of your new heater. If you have had started to experience problems with your water heater then contact us today to find out how we can help you. All the advice that we give is made without obligation and we will be happy to come and look at your heater to give it a thorough examination. If you decide that you do want to go ahead with a water heater replacement in San Tan Valley, AZ then we will work out the option that is going to be the most cost effective for you.